The cavern that houses Spain’s most celebrated prehistoric art is on the mend from a microbial infestation that closed it to the public. A push from regional government officials to reopen Altamira Cave to visitors has researchers who worked to improve its condition worried that their efforts will be undone (Science, DOI: 10.1126/science.1206788). 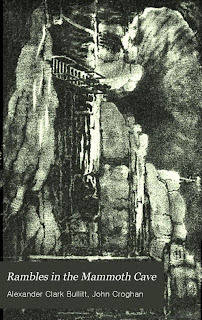 But like the bacterial colonies dotting the storied cave’s walls, the scientific and ethical issues that will determine its fate are colored in shades of gray. Nestled underground near a village in northern Spain, Altamira Cave contains astonishingly lifelike renderings of fawns, horses, and bison painted on its ceilings. The multicolored likenesses, more than 14,000 years old, are recognized as a pinnacle of Paleolithic rock art. The United Nations Educational, Scientific & Cultural Organization (UNESCO) declared Altamira Cave a World Heritage Site in 1985. 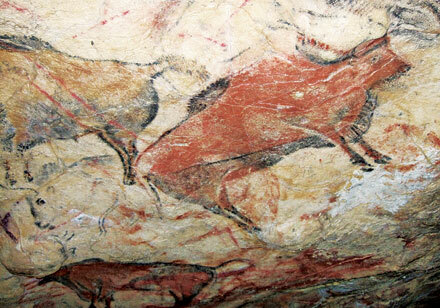 As Altamira became a tourist hub, ensuring its preservation became problematic. Officials closed the cave in the late 1970s, and then reopened it in 1982 to vastly reduced numbers of visitors. This limited schedule, however, wasn’t enough to keep the cave’s delicate ecosystem in balance. With bacteria encroaching on the paintings, officials closed the cave to the public in 2002. A team led by geologist Sergio Sánchez-Moral and microbiologist Cesáreo Sáiz-Jiménez of the Spanish National Research Council (CSIC) was tasked with cave cleanup and preservation. A cold-loving fungus is behind an epidemic decimating bat populations in North America. Researchers have confirmed that a recently identified fungus is responsible for white-nose syndrome, a deadly disease that is sweeping through bat colonies in eastern North America. The fungus, Geomyces destructans, infects the skin of hibernating bats, causing lesions on the animals' wings and a fluffy white outgrowth on the muzzle. When white-nose syndrome takes hold of a hibernating colony, more than 90% of the bats can die (see Disease epidemic killing only US bats). The disease was first documented in February 2006 in a cave in New York, and has spread to at least 16 other US states and four Canadian provinces. 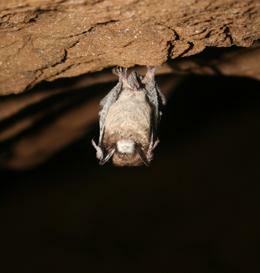 The culpability of G. destructans for this sudden outbreak was thrown into question when the fungus was found on healthy bats in Europe, where it is not associated with the grim mortality levels seen in North America. Some proposed that the fungus was not the primary cause of the catastrophic die offs, and that another factor — such as an undetected virus — must be to blame. But a study published today in Nature reveals that G. destructans is indeed guilty. Environmentalists are calling on government to protect the Yucatan's aquatic wonders from being lost forever. Mexico's incredible cave-like sinkholes, once revered as gateways to the underworld by the ancient Mayans, may need their surface openings closed because of pollution from the tourism industry and poor water treatment. The underground river system is the only source of fresh water for the Yucatan Peninsula but environmentalists fear that if the government does not act, the aquatic wonders may be lost forever. Al Jazeera's Rachel Levin reports from Tulum, Mexico. New Mexico Institute of Mining and Technology (NMT) invites applications for a tenure-track position to the Hydrology Program at the assistant professor level. The position is a joint appointment between the Department of Earth and Environmental Science and the Geophysical Research Center. Starting rate or salary range: $65,000 - $75,000. Applicants should have a Ph.D. in Earth Science, Civil or Environmental Engineering, or a related field at the time of appointment. We seek candidates with interest in combining hydrological modeling and field studies. Areas of particular interest include karst hydrology, watershed hydrology, ecohydrology, and aqueous geochemistry. Potential for excellence in teaching and research are the most important qualifications. Women and underrepresented minorities are encouraged to apply. Responsibilities will include developing an active program of extramurally funded research, supervising and supporting graduate students, and teaching two graduate or undergraduate courses per year. The successful candidate will join a group of six hydrologists including five fulltime hydrology faculty, eight adjunct faculty, and 25 graduate students. Hydrology is part of the Department of Earth and Environmental Science, consisting of 19 faculty and about 60 undergraduate and 90 graduate students. NMT is the home institution of the National Cave and Karst Research Institute (NCKRI), in Carlsbad, NM. A candidate with karst research interests will also be affiliated with NCKRI. Additional geoscience professionals on campus include over 30 staff members of the New Mexico Bureau of Geology and Mineral Resources, plus faculty and researchers in the Petroleum Recovery Research Center, and Petroleum and Mineral Engineering departments. 2011. The search will remain open until the position is filled. State and city officials say it is past time to put closures in place in and around caves in Jefferson County after crews rescued a stranded teen Monday. The rescue took place just west of Highway 93 in a subdivision near Golden. Officials say two teens were exploring a cave along a hogback when rocks began shifting. One teen was seriously injured. The other teen was able to climb out and call for help. "Caves have been created by weather and time," said Deb Zuck, Reclamation Agent. "We try to GPS all of the openings--both caves and mines--and as well, offer property owners free closure of the dangerous openings in and along the hog-backs." With dangerous gases, rock formations, and very dark conditions, the experts say exploring the mines and caves is dangerous at any level. With great sadness we announce the death of Claude Viala, former chairman of the CDS34 of the French Speleological Society, who passed away on March 25th 2012. There will be a private funeral, but if you would like to pay your respect it's possible on March 27th (whole day) or March 28th (only in the morning) in the funerarium of Grammont. From 15th to 18th September in Starigrad Paklenica fifth European cave rescue meeting was held. The organizer of this year's meeting was the Cave-Rescue Commission of the Croatian Mountain Rescue Service. Topic of this meeting was "testing of techniques and systems in cave rescue", but due to the large interest the meeting was expanded and included physicians and divers-cave rescuers. The meeting participants came from 12 countries: Slovenia, Bosnia and Herzegovina, Serbia, Montenegro, Austria, Romania, Italy, France, Germany, Switzerland, Great Britain, and Croatia. The meeting was formally opened on Thursday evening at hotel Alan where Vinka Prizmića, Head of the Croatian Mountain Rescue Service welcomed more than a hundred participants together with Stjepan Huzjak, Civil Protection Commander; Đani Bunja, deputy prefect of Zadar County; Krste Ramić, Mayor of Starigrad and Darko Bakšić, Head of the Cave-Rescue Commission of the Croatian Mountain Rescue Service. After the opening of the conference three working groups were formed: medical, technical and diving. Therefore short reports will be separately presented for each of the 3 groups. Technical group for testing techniques and systems in cave rescue began its work the previous day (September 14th). They tested manoeuvres used on Tyrolean traverses. Although the Italians, French and Croatians prepared dynamometer for testing and portable computers, it was decided that all testing is to be performed with the Italian equipment. Testing team from Italy was well-coordinated and brought 12 dynamometers and had all the necessary equipment. Rescuers from the Cave Rescue Commission of Croatian Mountain Rescue Service and Slovenian Cave Rescue Service performed all manoeuvres that were jointly tested. On Wednesday, 14th September straining Tyrolean traverse was tested with various pre-defined lengths from 10 to 30 m. The traverses were strained through stop descender and Italian hitch. Following situations were tested. For each situation 3 repetitions were made. - Manoeuvre of raising stretchers on a Tyrolean traverse using counterweight technique. On Friday, 16th September, Italian team presented the preliminary results of tests on Tyrolean traverses while more detailed report on the test results will be released after processing of the acquired data. - Cave rescue mission from Cave system Kita Gaćešina – Croatian Mountain Rescue Service – lecturer Darko Bakšić. As a part of the fifth meeting of European cave rescuers, on 16th and 17/09/2011, a meeting of the medical group was held which involved 17 rescuers, doctors and paramedics from 9 European countries. The meeting was organized by physicians Ulrich Nagel and Lana Đonlagić. Idea of the need for this form of cooperation was created last year in Saalfelden, Austria, when the topic of the fourth meeting of European cave rescuers was treatment of injured in caves. At this meeting, a group of rescuers – physicians was created who realized the existence of common problems in providing medical assistance in caves and created a list of issues worth further discussion, which was achieved this year in Paklenica. Topics of this year's meeting were the treatment of trauma in the underground, indications for specific types of therapy such as antibiotic, analgesic, prophylaxis, etc. due to the potential several days rescue operation. Emphasized the pursuit of providing medical assistance that will enable the injured person to independently exits the underground facility, in order to reduce the possibility of secondary incidents, facilitate and expedite rescue and solve problems such as the need for expanding the narrow passages. Problems are presented in the form of workshops, each having two technical leaders. At the end of each workshop conclusions were made, which were at the end of the meeting eventually formed into a consensus. Further more, the need for a tight international cooperation of medical personnel was defined in case of major accidents and the question of legal / financial possibilities of achieving such cooperation was opened. At the end participants’ need and wishes for further working meetings in this format were brought up and it was proposed to hold next meeting the following year in France, with subject being medicine in cave diving, where they would have the opportunity to discuss the specific features behind the rescue in siphons and rescuing after a long stay in a water. The success of this conference is perceived in the fact that the consensus was reached on all the discussion topics and the Internet basis was founded for the purpose of a continued exchange of experiences and information. 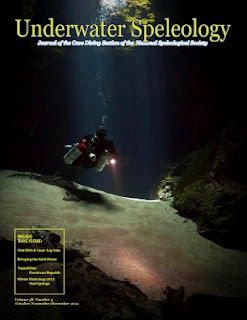 Better connections between people performing cave diving rescuing in Europe is needed so that they would be able to help each other in cases of larger and more complicated accidents. Also to be able to intervene in other countries that lack such a highly specialized type of rescue and the ability to exchange experience and participate in joint courses and exercises. Meeting in Paklenica during the 5th ECRM (as far as the participants knew) was the first such meeting organised only for the topic of cave diving rescue which at the end resulted with many conclusions that will significantly improve cave diving rescue in Europe. 6. It was agreed that once in two years there will be a joint meeting organised which would include practical exercises. The term of the first such meeting will be in October 2012, hosted by France. The whole event would last four days of which two days would include meetings, presentations of national resources, exchange of statistics and analysis of incidents, while two days would be reserved for practical exercises on the field where a certain procedure in Cave Rescue would be jointly trained. Topics of practical exercises would include a search for injured person in an area with more siphons (multi-siphon), where each country would have their part of tasks to solve. In addition to this historic meeting, participants had the opportunity to a mutual dive in the submarine near Paklenica where we exchanged experience using different techniques of diving. Members of CNSAS from Italy presented their mobile pressure chamber which was already operational for a year and serves only to secure their cave diving interventions. Also they presented us their book "Soccorso Speleosubaqua" which should soon be published in English. 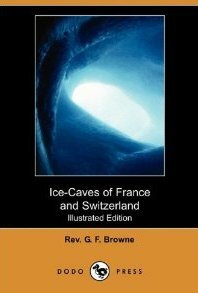 This book is the first such book in the world dealing with the cavediving rescue. Apart from the working meetings, a round table on the organization of the European cave rescue association was held where the next steps were agreed which should lead to interconnection of cave rescue services of European countries. European meeting of cave rescuers was held under the auspices of Zadar County and the Municipality of Starigrad. Sponsor of the meeting is hotel Alan. Continue reading for more pictures. The pre-registration website is now OPEN for the 2012 NSS Convention in the Greenbrier Valley of West Virginia!!! Please visit http://www.nss2012.com and register. Also, check back often as the site will be updated throughout the year. In the Babel tower that is Europe, Image and Speleology are the 2 common languages that all European cavers can speak. In this vision, it's with a very big pleasure that the FSE informs you of the official creation of the 1st European Speleological channel : "Speleo-TV". This project based on professional Web-TV sites will enable all European cavers to freely show, broadcast, exchange and watch on a specific high quality Speleological channel their underground images, videos and slideshows. The Speleo-TV workgroup that will be coordinated by a board (cf. signatures), will work through an FSE mailing-list in English language. the tasks in which you are more interested in. A multi-space agency group of future ISS residents have set up shop for 5 days of mapping, photographing and geographical sampling. This will serve as an "analog" space mission - one that helps them prepare for the challenges of exploration. 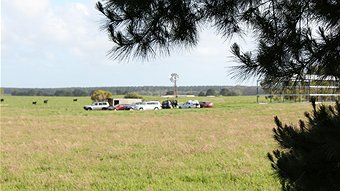 The death of a cave diver in Tank Cave near Tantanoola has shocked the close-knit cave diving community around the world and comes as the third death in the South East from the unique sport in two-years. 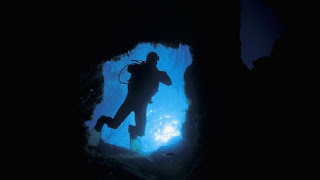 A 40-year-old father and experienced cave diver from Doncaster, Victoria was diving inside the cave with his buddy like they had done many times before at the same site, but failed to resurface from the dive. He was reported missing by his buddy who was a close friend, and the body was retrieved an hour later 50-metres from the entrance to the cave. Superintendent Trevor Twilley said relatives were notified on the evening of the incident which was now left to the coroner. "Most of the equipment has been retrieved along with the body to prepare an examination for the coroner," he said. Tetracion millipede from Alabama, USA. The International Journal of Myriapodology recently published the first population genetic study of cave millipedes. This research highlights an important challenge in the conservation of cave biodiversity -- that for many species caves are 'islands' of habitat that support isolated and genetically distinct populations. The southern Cumberland Plateau in Tennessee and Alabama, USA is known for its high cave density. In addition, it has the highest cave biodiversity of any region in North America. Millipedes of the genusTetracion range across this biodiversity hotspot. 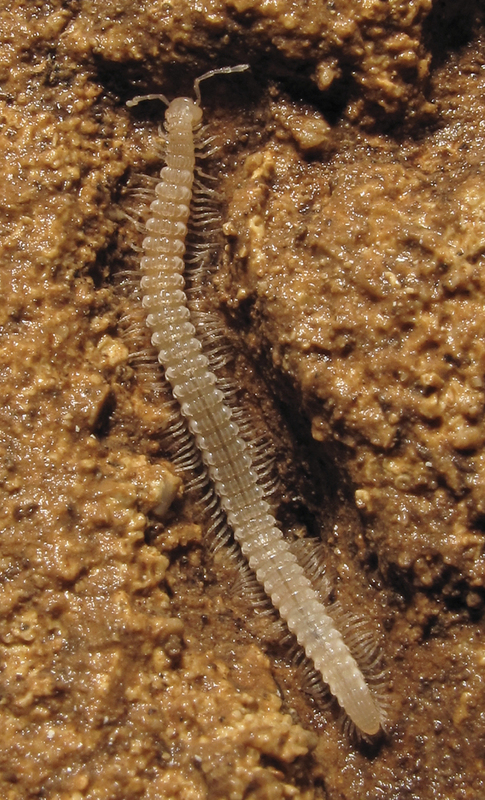 These millipedes, which can grow up to 8 cm in length, are common scavengers in cave communities. Like many cave animals, Tetracionmillipedes have reduced pigmentation and non-functional eyes. The authors used genetic techniques to compare Tetracion populations and species. They found thatTetracion populations were generally isolated from one another. In addition, divergence between Tetracion species was high, suggesting that members of the genus diverged several million years ago. A Victorian scuba diver who died in South Australia's notorious Tank Cave yesterday was 50m from the cave's entrance when he came to grief, it has emerged this morning. The 40-year-old Doncaster man and father was reported missing at about 3.45pm when he failed to surface. His body was found a short time later. South Australian police Supt Trevor Twilley said the man had 10 years experience and dived Tank Cave numerous times before. He said divers were required to have the highest level of diving certificate and go with another diver to tackle the cave. "On the return trip the buddy surfaced and learnt that his buddy hasn’t resurfaced," Supt Twilley said. "He has then gone back and located the diver deceased 50m from the entrance to the cave." Supt Twilley said he didn’t know if the man had run out of air. Search teams are now asking experienced spelunkers to aid in the search for 25-year-old Kevin Eve. 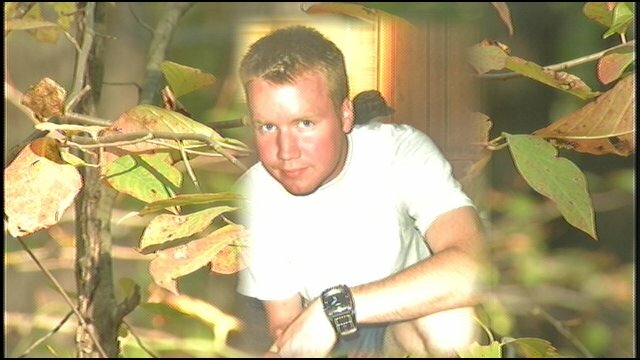 His car was found two weeks ago at the Harrison-Crawford State Forest in Crawford County. Eve is believed to have visited the area to explore caves in the forest. Teams are now looking for hidden cave access points and rechecking previously searched caves. Eve is still believed to be in the area. Pavel Rud’ko of Krasnoyarsk (Rissia, Siberia) has reported the success of the recent expedition of Krasnoyarsk cavers to the Sarma Cave, Arabika Massif, Western Caucasus. almost 200 m deeper, to reach depth of -1760 m and become the second deepest cave in the world. 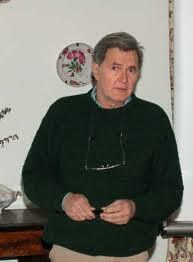 The expedition led by Pavel Rud’ko has been carried out between September 1st – October 7th, 2011. The main branch has been pushed to -1760 m after breaking through a narrow meander at the old bottom. Many side and ascending passages in other parts of the cave have been also explored. The expedition performed systematic temperature measurements, and speleobiological and microbiological sampling. With its new depth figure, Sarma surpassed the Illjuzia-Mezhonnogo-Snezhnaya system (-1753 m), located in the nearby Bzybsky Massif, and became the second deepest cave in the world, following Krubera Cave (-2191 m) located in the same massif. Thus, the western Caucasus now hosts three deepest caves in the worlds, two of them in Arabika Massif and one in Bzybsky Massif. Police fear an experienced 25-year-old spelunker may be lost in a Southern Indiana cave. 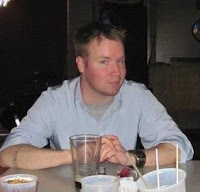 Kevin Eve of Georgetown, Ind. was last seen on Saturday in Corydon. His car was found Monday at the Harrison Crawford State Forest. Police said it is not unheard of that someone got lost in the caves. However, since Eve did not tell anyone where he was going, it makes it hard for police to know where to begin looking. Police said Eve is an avid cave explorer. The Harrison Crawford State Forest park spans over two counties. If you have any information on Eve's whereabouts, contact the Indiana Department of Natural Resources at 812-685-2498.
which had fallen into a North York Moors sink hole. Cleveland Search and Rescue service and York Caving Club joined forces to save the sheep after the alarm was raised by North Yorkshire Police. A total of 24 sheep had fallen into the hole which is the entrance to a system of caves known as Windy Pits, near Old Byland, Rievaulx. A spokesman for Cleveland Search and Rescue said that the sheep had fallen to a point about 50 feet below the surface after they broke through fencing around the hole. 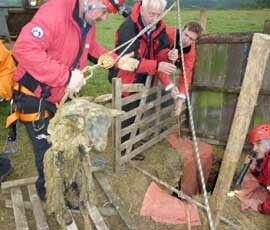 "Three members of York Caving Club had already rescued four sheep by the time we got there," he added. "Then two members of our team went into the hole and positioned themselves on a ledge about 15 feet below the surface to provide safety cover for the cavers, who could then descend deeper." The spokesman added that 'a dozen or so' sheep had been killed in the fall. 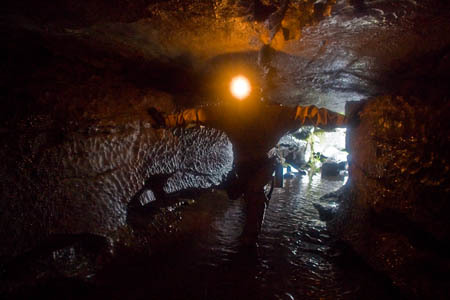 A search of caves by rescuers was called off after police were notified a potholer was safe. Members of the Cave Rescue Organisation began a search of Long Churn Caves and Alum Pot today after a car was reported to have been left overnight near Selside in the Yorkshire Dales. The Clapham-based rescue team assembled a small team and began searching at 9.35am today because of worries the vehicle’s owner may have got into difficulties in the nearby cave system. 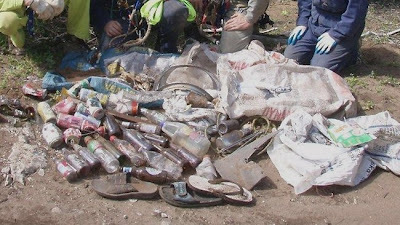 However, shortly after the operation began, the car’s owner, a caver, phoned police to say he had been forced to abandon the car after losing his keys. The callout was the team’s 69th this year. Walk into a cave in south-west China and you could be stepping back 30,000 years in time. 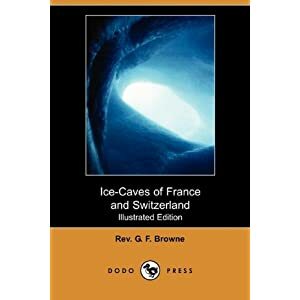 So says Alex Monro, a researcher in tropical plant diversity at the Natural History Museum, London, who thinks the caves could be a time capsule preserving rare nettles from the time of the last ice age. Working with researchers from the Chinese Academy of Sciences, Monro has identified seven species of nettle that grow in isolated, dark corners of the karst landscapes of Guangxi and Yunnan provinces. Some species can survive in conditions in which just 0.02 per cent of sunlight penetrates the cave – that's less than reaches 100 metres deep into the oceans. "They grow at the backs of the main caverns in near-dark conditions," says Monro. bridge are seen Tuesday evening. The historic drought in Texas is changing the behavior of the stars of one of the state’s natural summer marvels, raising fears the spectacle next year may be less spectacular. A depleting insect population has forced millions of bats around Texas to emerge before nightfall for food runs, making them more susceptible to natural predators. Some experts have already noticed fewer bats emerging from caves and have seen evidence that more infant bats are showing up dead, hinting at a looming population decline. “The drought makes for good bat viewing but is hard on the bats,” says Fran Hutchins, coordinator at Bracken Cave, home to the world’s largest concentration of bats, about an hour’s drive northeast of San Antonio. The cave holds some 20 million Mexican free-tailed bats that emerge for food runs every evening from March into November in numbers so great they show up on weather radar. The major difference this year is they’re emerging much earlier, as much as two hours before darkness, because they need to travel farther to find the drought-depleted insect populations such as moths that infest corn and cotton plants. 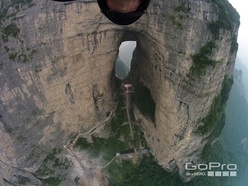 Recently, American Jeb Corliss jumped from a helicopter 1.8 km (6,000 feet) up and “flew” with his wingsuit, though China’s Tianmen Cave. While not the first time someone has flown through the cave, it is the first time it happened in a wingsuit. Tianmen Cave is actually just a huge natural opening in the side of Mount Tianmen, approximately 130 meters (426 feet) high, 30 meters (98 feet) wide and 60 meters (196 feet) thick. It was created when the side cliff face around the mountain collapsed, which opened the cross-section of cave. Interesting, the collapse is actually documented as happening in the year 263. In 1999, more than 800 million people watched a group of stunt pilots became the first to fly through it in an attempt to get into the Guiness Book of World Records. Take a gander at the following videos highlighting the flying feats. Archaeological research reveals that 13,000 years before CBeebies hunter-gatherer children as young as three were creating art in deep, dark caves alongside their parents. A conference on the Archaeology of Childhood taking place last weekend at the University of Cambridge revealed the latest research into art made by young children in one of the most famous prehistoric decorated caves in France – the complex of caverns at Rouffignac also known as the Cave of a Hundred Mammoths. Cambridge archaeologist Jess Cooney explained how meticulous research, using methodology tailor-made for the task, has made it possible to identify both the age and gender of the children who made the simple art form known as finger flutings around 13,000 years ago during the hunter gatherer period. Click here to download a copy (PDF, 6.40MB).